In 2014, ATC completed the ATC-102 project funded by the National Institute of Standards and Technology (NIST). This project resulted in NIST GCR 14-917-33 Report, Earthquake Resilient Lifelines: NEHRP Research, Development, and Implementation Roadmap, which identified the need for assessing societal expectations of acceptable lifeline performance levels and restoration times at the community level as a high-priority research and development topic. In response to this high-priority need, the NIST-funded ATC-126 Project was initiated in September 2014 to assess current societal expectations of acceptable lifeline performance levels and restoration timeframes that are informed by the phases of response and recovery, determining those that are hazard-independent and those that are specific for seismic (including tsunami), wind (including hurricane and tornado), flood, snow/ice, and wildfire hazard events. 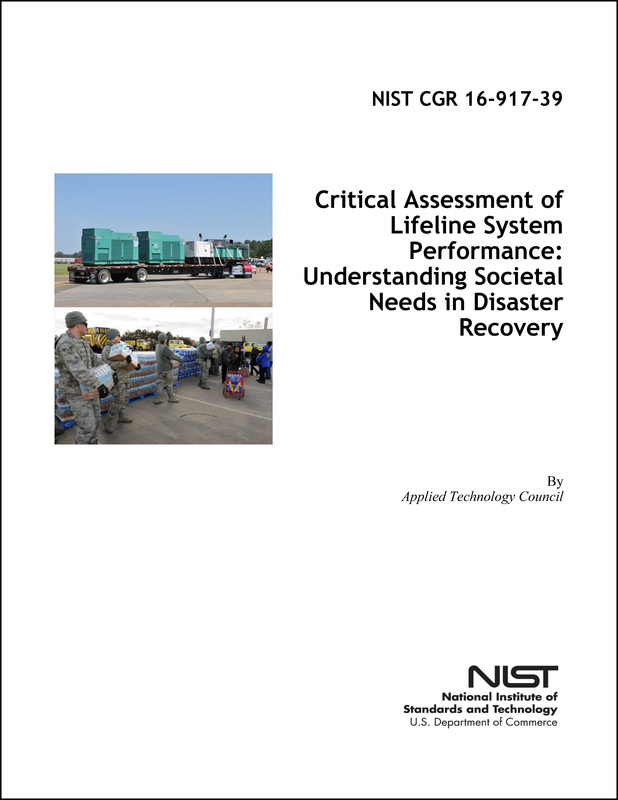 The ATC-126 project team developed the NIST CGR 16-917-39 report, Critical Assessment of Lifeline System Performance: Understanding Societal Needs in Disaster Recovery, which focuses on overarching critical societal considerations and system interdependencies of the following key lifelines: electric power, natural gas and liquid fuel, telecommunications, transportation, and water and wastewater systems. The report discusses the social institutions and societal needs that should drive lifeline system performance levels and recovery timeframes. The report identifies important gaps between expected lifeline system performance and societal needs through the evaluation of performance and impacts during past events, as well as an assessment of key guidelines, standards, and performance criteria that govern and shape the design, construction, operation, and management of lifeline systems. Recommendations particular to lifeline standards, research, modeling, and lifeline system operations are included in the report. The ATC-126 project is part of a larger effort to help transition from current utility-specific crisis management practices to a more integrated and consistent approach to interdependent lifeline systems performance and community resilience enhancement. The findings from this report are intended to inform other resilience efforts.